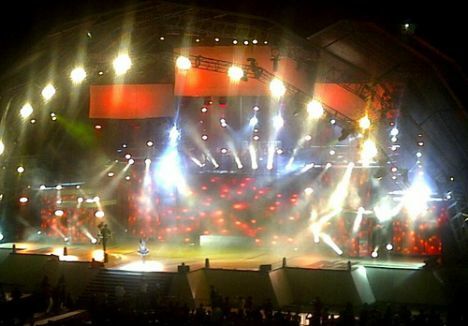 Chomee performing during the opening ceremony, tweeted by PruLuv. The 2011 Metro FM Music Awards went down at the Mbombela Stadium in Nelspruit on Saturday night (26 November) and delivered awards in 20 categories, including a double whammy Lifetime Achievement Award. Both Spikiri and Ray Phiri were honoured for their lifetime achievements while AKA, Zahara and Big Nuz headlined the night with multiple wins. The ceremony was hosted Tbo Touch and Zizo Beda and opened with a performance by Chomee, Nothende and Theo Kgosinkwe. As the action unfolded various shenanigans hit the show, most specifically an explosion of behind-the-scenes noise and panic that the audience could overhear. Also loud was Zahara's swing from winner to cringe-moment. The newcomer won two prestigious categories and iced her trophies with a headline performance. Word from Taz' is that he grabbed lots of pics and gosss so keep a lookout for the sc-ooh-p.
Top Digital Download Award: DJ Cleo. The Lifetime Achievement Award: Spikiri and Ray Phiri. The ceremony airs on SABC1 on Friday, 9 December at 21h00. "BIG NUZ" ezase? Qedela wena. Well done to all the winners. NO Theo.......n Micasa...welldone to AKA , Zahara, Dj Cndo and Big Nuz, wow!! i hope WE WILL WORHIP YOU they make them known now in the Gospel scene after beating Rebecca.......if beat Rebecca huge!!! honour for artist or group!! Dzang! Loving Madoda's "Mzizi" so muuuuuuuuuuuuuch! Best dance should have been Culoe de Song n that category (love C'ndo tho!) but ke boy has talent straight up! Awuuuuuu Big Nuz bayebaba serious halalaaaa! Zahara no Loliwe wakhe bebeyidudula strongo neh well done sisi askies fr the technical misshap...I love that Morale ft Zola won best collabo *singing* "Ayamaah phakama ngikubambe ke" I heart that line so much!! Well done to all the winners, cant wait to see Zahara's performance on tv kwaaaaaaaaaa! Ezase Durban :-) Afro Afro !!! Our Church Band...We Will Worship...won!! We all so proud of you guys at His People Joburg...you guys really did well!! I am very very very proud of WWW-the movement be gings ( We will worship). Best gospel band in this country IMP. Representing His People. I loved their first album One thing to BITS. Still need to get acquanted with this one. AAAND congrats to Zahara. Done. Waves at Phikzah, reallyyyy!!!! ....as one of the famoue HP phrases go " COME ON CHAMP!!" Lol..nice to know sisi. I love the Ayamaah song.............Tomone i thought Micasa is gonna won that video award. I didn't know you were also voting for WWW. I don't have the cd yet. But I defs voted for them. I haven't sunk my teeth into this one. 'One thing' left a very good impression. I just want to express my disappointment in SABC1. Last night, 9 December 2011, the Metro FM awards 2011 was broadcasted on tv with much anticipation we watched the awards in hope that we would see the winner of the R&B best album award presented to the onlywinnner from from CAPE TOWN Lloyd Jansen and by some strange events this was edited and cut out of the programe. How disgusting not even a mention - how are we supposed to support every South African artist in this country when some artists are discriminated against and EDITED to suit the needs of others. A formal apology should be announced.